Clematis 'Multi Blue' has very large, striking deep purple-blue, double, sometimes single flowers from June to September and has the absolute 'wow' factor. An outstanding variety of continental origin, deserving a very prominent place in the garden. This non-evergreen climber can be grown against a trellis, garden fence, wall, arches, pillars, pergolas, clambering over tree stumps and through large shrubs or planted in a container trained up bamboo canes or an obelisk. 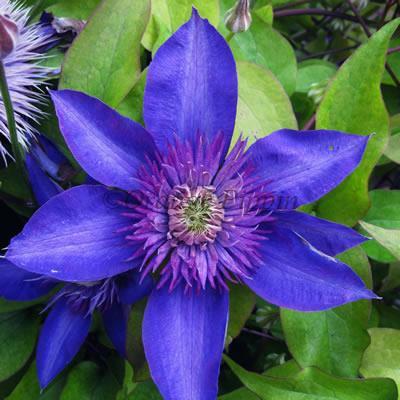 Clematis 'Multi Blue' was raised in the nursery of J. Bouter and Zoon, Boskoop, Holland.